In this episode, blogger/author Teresa Swanstom Anderson shares how she went from not wanting children in her 20s to having a house full of kids today. She reminds us that God put each one of us here, in this time and place, for a purpose. You’ll learn about her struggle through a season of waiting for God to reveal His plan for her life and how she figured out the direction she was going wasn’t it. She also teaches us what happens when we forget that closed doors can be an answer to prayer for doors to be opened. 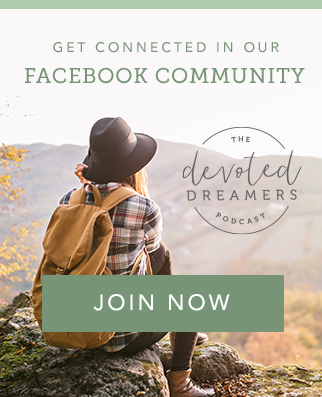 In this interview, Heather Holleman reminds us that we can be deceived into thinking there’s life in the dream, instead of finding life in the Dream Maker. She shares the incredible power and joy we can find in living for the praise of God’s glory, and she reveals her daily practice of confessing the sin of self-exaltation. Finally, she talks about how the Lord may bring us through a season of preparation before we really see our dream come to fruition and what we can do in the meantime. In this interview, author and Bible study teacher Tiffany Bluhm helps us dump the mom-guilt that can come with trying to balance dreaming, raising kids, and caring for a home and a husband. Instead she talks about making the most of our time, asking for help when we need it, and how not to miss out on the dream God’s put on your heart—even if you feel too busy to pursue it. Her advice to the dreamer, near the end of our conversation, about finding someone who’s already doing your dream was priceless.